If you're looking for a nourishing beef-free barley soup recipe, most recipes use mushrooms to pair with the barley—but this meatless tomato barley soup uses tomatoes and the standard soup ingredients of carrots, celery, onions, and garlic to carry the flavor. There's little additional seasoning, so this homemade vegetarian tomato barley soup recipe is simple, easy, and nourishing. You can buy barley in bulk, making it extra-environmentally friendly. It has got that uniquely chewy texture, it's cheap, filling, homey, and comforting. What's not to love about barley? 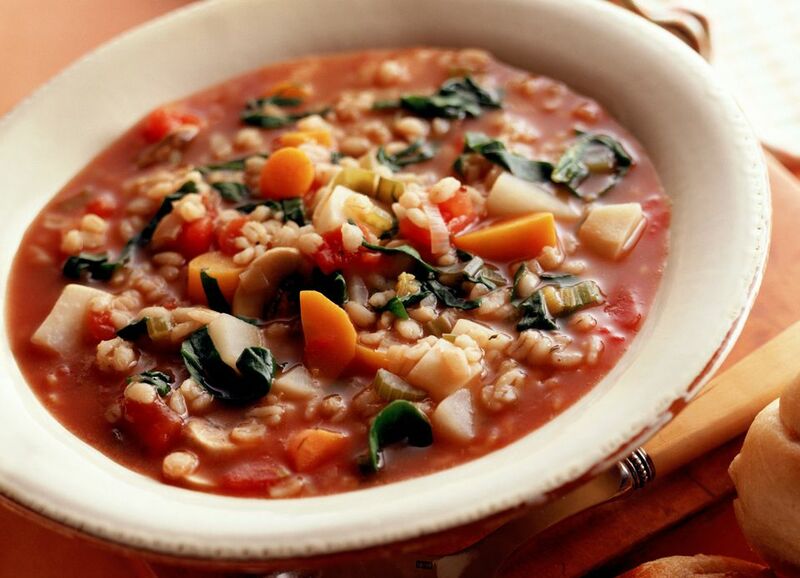 This vegetable barley soup is both vegetarian and vegan as is, though (if you're not eating dairy-free or vegan) you might like to top it off with a bit of fresh grated Parmesan cheese just before serving for a nice presentation and extra flavor. Either way, enjoy! In a large soup or stock pan, heat onions and garlic for a minute or two, then add the chopped carrots and celery. Heat for 4 to 5 minutes, just to start the vegetables cooking a bit with a head start. Add the can of diced tomatoes (do not drain), the vegetable broth, barley, and the Italian seasoning, stirring well to combine. Bring to a boil, cover, then reduce to a medium-low simmer. Cook for 30-40 minutes, or until barley is cooked and carrots are soft. You may need to add a little bit of extra water or vegetable broth. Once the barley is cooked, stir in the fresh spinach and heat for one more minute (just until barely wilted), then turn off heat. Season your soup generously with salt and pepper.